In two reports that will be presented at the UN this fall, I urge international financial institutions to embrace policies focused not solely on economic growth but also on human rights protection. While recognising good steps taken, the Bank’s continued promotion of privatisation, inconsistent track record of heeding its safeguards and the continued lack of accountability for rights violations committed, demonstrate the need to mainstream human rights in the Bank’s founding agreements and in its everyday practice. 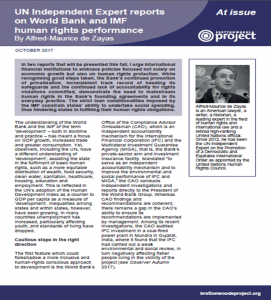 The strict loan conditionalities imposed by the IMF constrain states’ ability to undertake social spending, thus hindering states in fulfilling their human rights obligations. A fully-formatted PDF version of this briefing is also available. The understanding of the World Bank and the IMF of the term ‘development’ – both in doctrine and practice – has meant a focus on GDP growth, increased trade and greater consumption. Yet, observers, including the UN, have a different understanding of ‘development’; assisting the state in the fulfilment of basic human rights, such as a more equitable distribution of wealth, food security, clean water, sanitation, healthcare, housing, education and employment. This is reflected in the UN’s adoption of the Human Development Index as a counter to GDP per capita as a measure of ‘development’. Inequalities among states and within states, however, have been growing, in many countries unemployment has increased, particularly affecting youth, and standards of living have dropped. The first feature which could foreshadow a more inclusive and human-rights conscious approach to development is the World Bank’s Office of the Compliance Advisor Ombudsman (CAO), which is an independent accountability mechanism for the International Financial Corporation (IFC) and the Multilateral Investment Guarantee Agency (MIGA), that is, the Bank’s private-sector arm and investment insurance facility. Mandated “to serve as a fair, trusted, and effective independent accountability mechanism and to improve the environmental and social performance of IFC and MIGA,” the CAO conducts independent investigations and reports directly to the President of the World Bank Group. Whereas CAO findings and recommendations are coherent, there remains a gap in the CAO’s ability to ensure its recommendations are implemented by management. Among its recent investigations, the CAO made useful recommendations concerning the failure of the IFC to monitor the environmental and social performance of the Amalgamated Plantations Private Limited project in India. The CAO also audited IFC investment in a coal-fired power plant in Mundra in Gujarat, India, where it found that the IFC had carried out a weak environmental and social review, in turn negatively affecting fisher people living in the vicinity of the project (see Observer Autumn 2017). Complementing the work of the CAO is the Word Bank Inspection Panel (IPN, see BWP Inside the Institutions June 2006). Established in 1993 as an independent complaints mechanism for those who believe they have been, or are likely to be, harmed by a Bank-funded project, the IPN is composed of three members who respond directly to the Bank’s Executive Board and remains independent of Bank management. While IPN recommendations are good, they are not self-executing and significant portions of the Bank’s portfolio, such as development policy lending, remains outside its mandate. In addition to hearing petitions, the IPN launched an Emerging Lessons Series in 2016, addressing historically problematic issues in the Bank’s work, including involuntary resettlement, engagement with indigenous peoples and environmental assessments. The Panel also collaborates with other mechanisms, such as the European Investment Bank, with whom it completed a joint investigation in Kenya in 2015, adopting a mediation process. In March 2016, the IPN published guidelines seeking to reduce incidents of reprisals faced by those who submit complaints to the IPN. These are commendable efforts which should be replicated to address the many human rights issues relevant to the Bank’s work. In August 2016, the World Bank adopted a new Environmental and Social Framework (ESF), which sets out the Bank’s standards for safeguarding communities and the environment in which its projects operate. While the ESF could be further enhanced, it includes goals important to human rights such as environmental sustainability, social inclusion and the preservation of resources. The chapter on indigenous rights insists on free, prior and informed consent of the peoples affected by World Bank-financed projects. On the down side there is no specific recognition of core conventions of the International Labor Organization (ILO). Moreover, at the IMF, there is evidence of discussions within the institution’s research department on expanding an otherwise narrow guiding ideology that prioritised ‘growth’ and macroeconomic stability above all other considerations, to now reflect on broader issues such as the relationship between macroeconomic policy and income and gender inequalities. This work is now being operationalised in limited ways, and in June 2016, IMF staff wrote a blog entitled Neoliberalism oversold?, which questioned the sustainability of the IMF’s own policies that have been seen to increase inequality. The victories of this so-called “IMF Spring” (see Observer Summer 2017) are a reason for cautious optimism that the institution might have capacity for change. While these efforts go beyond the “do no harm” principle and aim at maximising development gains, past projects financed by the World Bank and the strings attached to IMF loans have caused and continue to cause harm to millions of people. Additionally, concerns about the Bank’s ability to demonstrate the positive development outcomes of its investments and activities, as opposed to growth, remain. As it stands, both the Bank and the IMF continue pressing for reliance on purely market-based solutions, following the perspective of “market fundamentalism” that Joseph Stiglitz often decried. For example, there has been an increased focus on mega-infrastructure projects (see Observer Winter 2017), a reliance on public-private partnerships as a way to circumvent constrained fiscal space to some extent caused by an unjust global tax system (see Observer Autumn 2015) and a continued effort to impose so-called labour flexibilisation and other obsolete conditionalities (see Observer Summer 2017). In addition to this, civil society has identified human rights abuses committed in conjunction with World Bank-financed projects. Among the most egregious violations are land-grabbing, brutal evictions, involuntary resettlement, forced and child labour, sexual abuse, reprisals against human rights defenders, corruption, money-laundering, massive pollution and destruction of the environment. There are instances where the Bank has not followed its own operational policies with respect to protecting indigenous rights and in assessing labour and environmental risks (see Bretton Woods Project rights page). In my report to the General Assembly on the adverse impacts of IMF lending policies, I raise the adverse impacts of IMF lending policies in Argentina, Greece and Tunisia as case studies to show that the imposition of austerity results in budgets too constrained to maintain social spending (see Bretton Woods Project conditionality page). Strict and selective IMF conditions, such as the requirement that countries demonstrate rapid economic growth, discourage states from making long-term investments, like those required to improve health care and invest in public infrastructure. Moreover, the lack of a global consensus on sovereign debt restructuring means states that can no longer pay back their loans may be pushed into debt crises to the detriment of their populations and benefit of their creditors. These factors weaken states’ capacity to guarantee rights and can lead to under-resourced public sectors which are vulnerable to breakdowns and emergencies, and suffer from increased lack of legitimacy. Further, in both reports, I argue that the Bank and the IMF could play a greater role in the fight against tax evasion by expanding their focus from technical assistance to individual tax offices to pressing for fundamental changes in global tax governance and increased transparency. Oxfam has highlighted in particular the fact that the IFC invests in companies that take advantage of tax havens. As I reported to the General Assembly in 2016, cooperation with tax havens deprives countries of revenue which could be used to meet their human rights obligations, fulfil the Sustainable Development Goals (SDGs) and repay foreign debts. In a similar vein, corruption and a lack of fiscal transparency are costly, so I encourage the IMF to more consistently raise these issues, both in conjunction with its distribution of funds and as a pre-condition for borrowing. It is time for the World Bank and the IMF to align themselves with the rest of the UN system and ‘discover’ their new vocation to promote development and human rights through ‘smart’ lending practices that benefit not only banks and speculators, but billions of human beings. In my recommendations to the Bank, I propose a change of paradigm which would require amending the Bank’s legal framework as well as clear directives on human rights from the Bank’s board of governors. A section of the Bank’s founding Articles of Agreement, which provides that the Bank “shall not interfere in the political affairs of any member,” is often cited as an obstacle to robust action on human rights. However, there is no reason to consider the promotion of human rights as falling under the prohibition. On the contrary, all states parties to the agreement are also UN members and are thus bound by the UN Charter. 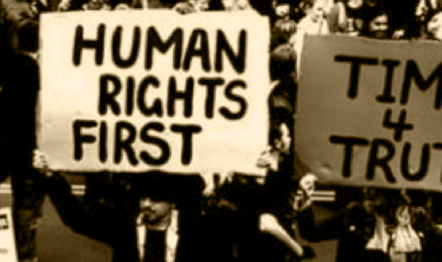 Moreover, many have ratified numerous human rights treaties, thereby accepting human rights obligations. Thus, the promotion of human rights should not be considered ‘political’ in this context. Indeed much of the Bank and Fund’s work on fiscal issues, social protection, flexibilisation of the labour market, education and health are highly political. On the other hand, it is important to note that the Articles of Agreement and the Agreement between the UN and the Bank were adopted prior to the Universal Declaration of Human Rights and before core human rights treaties entered into force, provisions of which have surely emerged as customary international law today. If seen as contradictory, the Articles of Agreement should be amended to match the current obligations of states and international institutions. In addition, it is clear that the World Bank must implement preventive and corrective measures to ensure effective participation by all stakeholders. To do so, it should develop a standalone human rights policy and strengthen the new ESF, making it clearer what constitutes the free, prior and informed consent of affected communities. It should require that human rights, health and environmental impact assessments are undertaken before the initiation of any project, and it should incorporate a commitment to international labour standards. 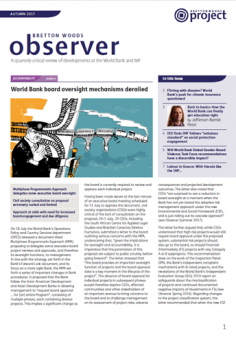 Discussions at the World Bank’s executive board to ‘streamline’ its oversight of management reflect a worrying trend contrary to these recommendations (see Observer Autumn 2017). A key challenge that must be addressed is the World Bank’s decision-making structure, which creates inequitable and sometimes counterproductive priority setting. I recommend that there be more representation of developing countries in the Bank’s decision-making bodies. I also urge that the Bank further co-operate with international organisations in related fields, such as the UN Conference on Trade and Development, the UN Economic and Social Council and the ILO, given they have proposed plans of action to advance development and human rights. As regards the IMF, I urge it to change its priorities and finally let go of the outdated conditions of privatisation, deregulation of markets, and ‘austerity’ in social services, which have not given states adequate policy space to fulfil their human rights obligations. Rather, I recommend that the IMF work to establish reductions in military spending, tax havens, financial transactions tax, and enhancements to the rule of law. In particular, the IMF should request borrower states to institute moratoriums on military expenditure (except for salaries and pensions) for the duration of their loans, enabling states to re-direct revenue to development. I call on the IMF to assist states in developing legal and administrative frameworks that will enable them to capture lost taxes, deter profit-shifting and prevent waste. This work should be complimented by advocacy for changes in the global tax regime and strong calls on states to abolish tax havens. I also recommend that the IMF obtain the commitment of states that they will not use loan monies to satisfy claims by vulture funds or hold-outs. As a separate matter, the IMF should play a proactive role in pushing for a global consensus on sovereign debt restructuring. This would help prevent states from falling into debt crises, which has disastrous consequences for the realisation of economic, social and cultural rights in a number of countries. Moreover, the IMF, like the World Bank, must guarantee that, when its policies and practices lead to human rights violations, victims have effective recourse mechanisms and meaningful restitution. The World Bank and IMF must be more than a “fig leaf” for the status quo. A democratic and equitable international order, as envisaged by the Human Rights Council, can only be achieved through international solidarity, not only by the UN but also by international and regional financial institutions. The SDGs will only be achieved if these institutions mainstream human rights into their agendas and proactively support targeted policies that respect the policy space of all states.